Hello, I am Daniel, a thirty-seven years old designer. I have been working in graphic design since the age of 18 when I was hired by Grapho-Cinco. A well-established press company responsible for the publication of the motor-sports magazine Prototipos. While with Grapho-Cinco I had the opportunity to learn from the best and most qualified publishers that were still accustomed to work without the technology we currently have. This allowed me to learn “hands on” the real process of the pre-press and publishing business. From the begining design step, which was my department, to the very last step of packing and delivery. Passing, of course, through the very interesting step of press printing and cutting. After a few years, I accepted an offer to work for Avalon Studios, a recognized design firm that had many important corporate clients in their portfolio. At this time, I switch from working with PC computers to Mac OS computers. I hold a Sociologist diploma from the Venezuelan Central University (Universidad Central de Venezuela) and took interest in the social study of masses. As life will have it, I moved to the US where I lived for the past 17 years. I began to work as the Marketing Director and Operations Manager for a multi environmental services company but I never abandoned my freelance work of graphic design. I’m a husband and a father of three wonderful kids. I am skilled and well trained in Adobe Photoshop, Illustrator, dreamweaver, Flash, HTML5, and CSS3. I love the potential and the results of PHP and CSS when put together. I try to learn a new skill every time I can and I love what I do to the point of not giving up on a project until I am fully satisfied with the results. Even if it means studying and learning a new skill. I can also maintain your website and make any type of changes that will adjust to your needs as well as run the analytics and make the necessary adjustments in order to improve your chances of showing up in the search engines as close to the first result as possible. Stay away from design studios that promise you to be on the #1 ranking or first page in Google in exchange for money. They might even claim to know “secret tricks” or have important contacts that can make it happen. Sites like Google are constantly reminding people about these scammers. This reminds me about this website I saw not too long ago. The owner was proudly showing us the design made by a local studio. After telling me the excessive price he paid (which apparently was OK to him) he also revealed that he was paying over 300$ a month for the “website maintenance”. Unfortunately, he had already paid several months, costing him over a thousand dollars, but just for curiosity, I run a quick diagnostics of his website just to find out that his site was not even indexed by google. This bothers me because it gives a bad name to honest designers that offer these services for a realistic price and in some cases for free. There are many good designers out there to choose from. Hiring the services of the most expensive one doesn’t guarantee you will be in good hands. 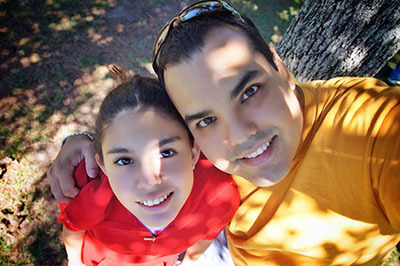 With my daughter Kelly at the park. 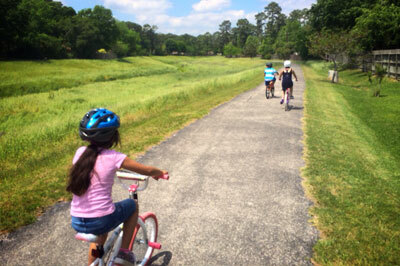 One of our favorite past time is to ride the bikes at different parks and trails around the city. Kids and nature… They can be a great source of inspiration. I’m blessed with a wonderful family that inspire me with their imagination.